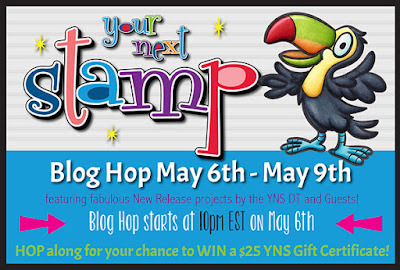 Hollybeary Creations : YNS May Release Hop!!! Yay.... 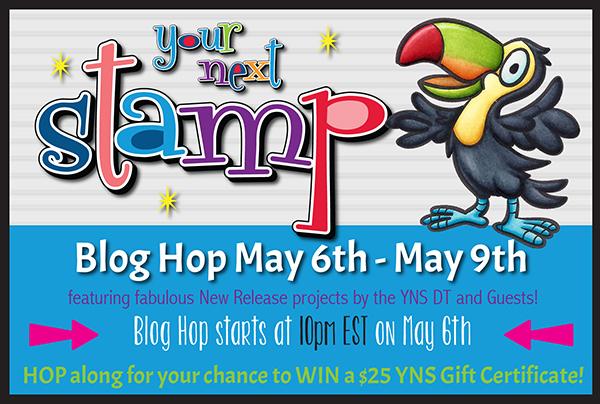 It's time for the Mar Release Blog Hop from Your Next Stamp!!! Join the Design Team as we share Fun projects created with this month's release. Be sure to leave comments as you hop for a chance to Win a $25 GC of your own!! My first project is using the new set Got Mud? And the coordinating Mud Splatters set!! I created a Distress Ink background then die cut the panel using the Funky Line Panel Die and adhered the panel to a Black card base. Then I colored the trucks in with Copics and used the coordinating dies to cut them out. I adhered them to the front of the card and stamped the sentiment. On the inside of the card I added a Mud Splatter using some Mocha and Latte Inks. Then I stamped an additional sentiment from the set. My second card using the new Sunburst Panel Die and Good Vibes Stamp and Die set. I created a Distress Panel then I die cut it using the Sunburst Panel Die. I cut an additional panel with the same die using White card stock and adhered that to a Black card base. Then I inlaid the Distress pieces from the first panel I cut. I stamped the toucan image onto some Copic friendly paper with Black Olive ink and colored him in. Then I used the coordinating dies to cut him out. I stamped the sentiment in the center of the panel in Black ink and then I added some Black Gumdrops for an extra pop!! Are you ready to Hop Along??? Don't forget to leave comments along the way for a chance to WIN!! And all the products are now available in the store! Oh Holly, I just love how used the monster trucks. Brilliant background gf. Another cool card using the Sunburst panel. Your truck card is AMAZING!!! I so wish I would have ordered that set too!!! especially since I have that die!!! I love your card...I did order the toucan and die. What fantastic cards!! Love the cool backgrounds you've created! Wonderful cards with such fun and beautiful new releases. Love them all. I just adore that toucan. Your cards are amazing. 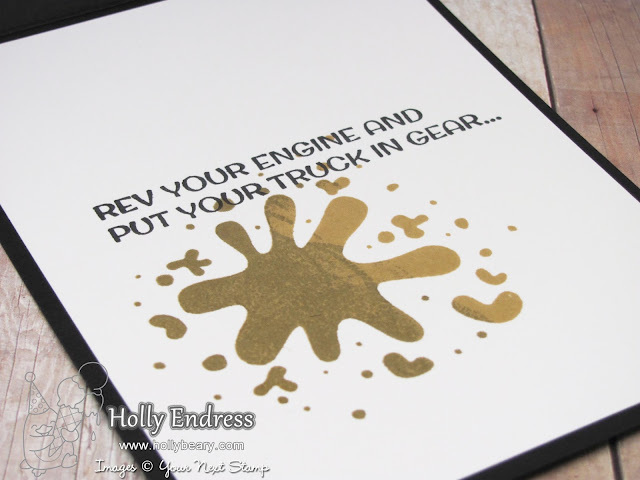 I love both of the backgrounds that you used on these cards, Holly! Great ideas! Great cards Holly. Love how you paired the trucks with the funky lines panel. Perfect match. I love the toucan card. So fun! I love the cheerful messages of your card, Holly! Colorful and fun! Two delightful cards. 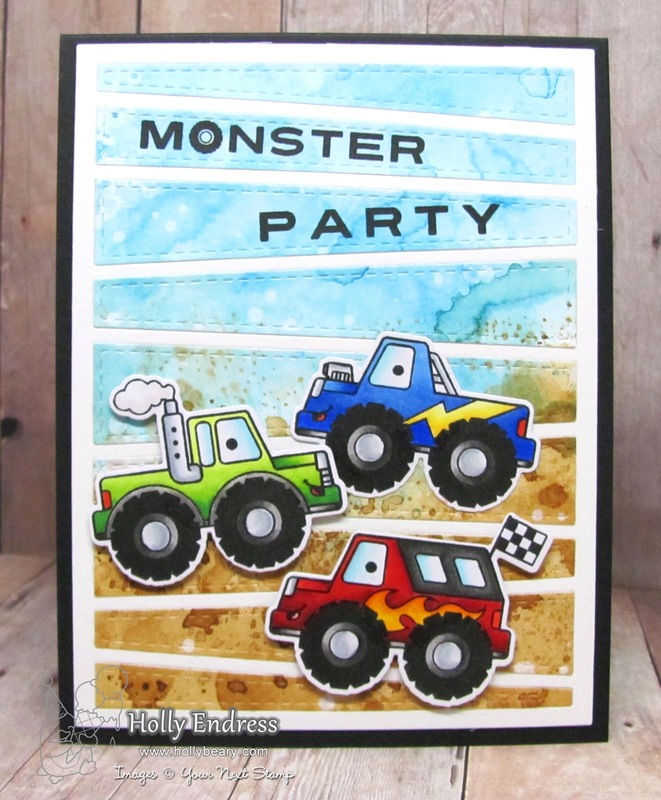 Especially the way you carried the truck theme inside the card. Thanks for sharing your creations on this blog hop. Great cards!Love the sunburst panel die...it makes the image really stand out! Both of these cards are fabulous! I love the new sets! There are so many great images to use on masculine cards! The frosted glass Gumdrops are my new favorite! Thank you so much for the inspiration! Love how you used the dies in the back ground - what a clever idea. Your coloring is beautiful! monster truck card; awesome sauce! Cute cards. I love the monster truck set. I love your sunburst background on the second card. great showcasing that sunburst die!! I like the backgrounds on both of your fun cards. Your cards are so cute! I really like the toucan and that sun rays die is nice. Oh, my!! These are both so adorable!! I'm lovin' both of these sets with their fun sentiments! Both cards are so CASEable! Really love the way you used the panel dies. Your monster party card is wonderful. And you didn't just stop at the outside, the inside is perfect with that splat of mud. Your toucan is colored to perfection. Great job. Awww!!! How fun!!! Such gorgeous colors!!! Really adorable!!! Hahaha, "toucan of my appreciation" is so punny and cute! Love the bright yellow sunburst background using the new die! So creative! Love that you showed how you put the sentiments on the inside. Adorable! Very cute cards. Love the background die. Amazing cards! Love the dies you used too! I really like them both-but that toucan gets me everytime! Great job! Your backgrounds on these cards are fabulous! fun and funny--great bg for the truck!